Everyone remembers their first SERIOUS chilli encounter…that burning sensation that makes you feel as though your face and then entire body is on fire. And yet, you can’t help but go back for more. Many locals tell me it’s like an addiction and once you start having sambal on all your food, anything else just doesn’t come close. It’s also said that chillies are an aphrodisiac but if you are new to hot sambal, I probably wouldn’t recommend piling it on your meal at a first date or romantic night out! 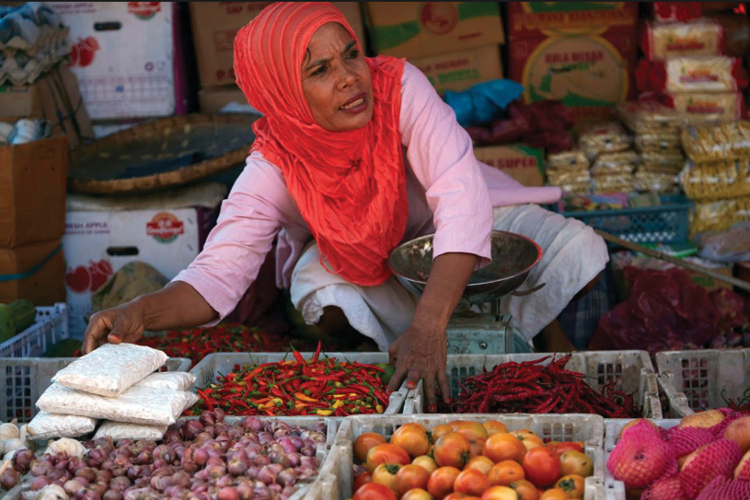 When I first moved to Indonesia, I thought I would try to make my own sambal. I scoured recipes, I sourced all the best chillies I could find and prepped all afternoon. Chopping, crushing with the mortar and pestle, and putting the mix into containers for storage. About 30 minutes after the chilli chopping frenzy was over, my hands started to burn…as in, felt like they were on fire! I tried everything: I washed and scrubbed my hands; I rubbed aloe all over them; I put them in milk and yoghurt (a local friend told me it worked but possibly she was just joking); I walked around with my hands covered in butter (old wives tale for burns). Nothing worked. I went to sleep with my hands in plastic bags full of ice. The next morning, I told a friend from Flores the story and she laughed hysterically. Not particularly supportive I thought although I can see why my rookie mistake had her laughing. Firstly, I didn’t wear gloves and while seasoned sambal makers might not wear gloves, as a newbie, you probably should. Also, the day before my sambal-making efforts, I had been learning how to make traditional offerings and so my hands were covered in tiny little pricks made from the fine bamboo sticks and leaves. Imagine pouring chilli into paper cuts…. Sambal and chillies are an integral part of cooking in Flores and each dish is seasoned using either a different variety of chilli or a different style of preparing it. 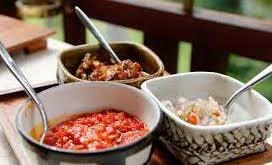 While not a foodie blog, we have included the recipe for one of our favourite sambals found in Flores. If you have a favourite sambal or dish from Flores using chillies, please send it to us at contact@thevoiceofflores.com and we’ll share it here. Check out two recipes below. 1. Grind shallots, chillies, garlic, shrimp paste, salk and sugar, all together in the stone mortar. Not too mushy, just enough to be mixed. 2. Add kaffir lime, fresh lime juice and thai basil and mix all together.